A growing number of Britons borrow money to afford the cost of Christmas each year, leaving people with a financial hangover once January comes around. 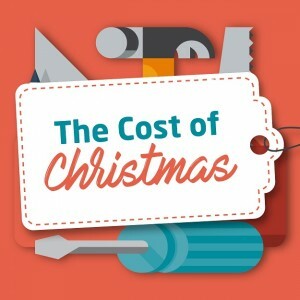 Take a look at our newest infographic to discover just how much credit cards and pay day loans could end up costing as well as finding out how much our favourite festive singers still earn from their most popular Christmas songs. With the average Christmas costing £796 and many people starting the New Year in debt, it’s no wonder that we’re looking for alternative ways to fund our festive spends and ease our financial hangovers. The cost of 2016’s top toy according to Toys R Us, Chip the Robotic Dog, is £200. The UK is the third biggest spending country at Christmas time. Czech Republic is 2nd and the 1st is Romania. 1 in 10 people in Britain are planning on getting a second job to pay for Christmas. 35% of Britons borrowed money to pay for Christmas presents in 2015; either from friends and family, credit cards, pay day loans or store cards. Considering the average credit card interest rate is 21.6%*, average store card rate is 26.2% and the average pay day loan rate is a whopping 280%, that’s a lot of people starting the new year in debt! Christmas isn’t Christmas without festive films and songs, and the most popular films and Christmas songs still make their creators a huge amount of money! Despite being released 43 years ago in 1973 Slade still earn a cool half a million each year in royalties from their song ‘Merry Xmas Everybody’. Not only is ‘Fairytale Of New York’ the most played Christmas song of the 21st century, but despite being originally released in 1987, still earns The Pogues around £400,000 each Christmas in royalties. The ever popular Christmas party tune ‘All I want for Christmas is You’ was released in 1994 and still tops up Mariah Carey’s Christmas spends by £376,000 each year. The iconic Home Alone is the biggest grossing Christmas film of all time, grossing a huge £382,135,255 since its cinematic release in 1990. There’s no surprise that its sequel, Home Alone 2, which was released in 1992 is the second highest grossing Christmas film bringing £287,788,964 home from the box office! The third highest grossing Christmas film is 2000’s How The Grinch Stole Christmas, better known as The Grinch which has grossed £276,608,926. Good conquers evil, especially at Christmas time. The plans of our favourite villains may have been thwarted in the end but here’s how much they would have stolen. The Grinch would have stolen £265,068 worth of Christmas by stealing the holiday from Whoville. Hans Gruber from popular Die Hard, tried to steal a huge $640 million (around £513 million) in his attempted heist on Nakatomi Plaza, luckily John McClane was around and stopped Gruber in his tracks! Perhaps the worst festive villain is The Nightmare Before Christmas’ Oogie Boogie. This villainous sack filled with bugs and creepy crawlies kidnapped ‘Sandy Claws’ on Christmas Eve, stopping Father Christmas from delivering a whopping £292.27 billion worth of Christmas presents! Would you like to hear more about our services and maximising your tax rebate? Should I Apply For Gross Payment Status﻿? What Could Brexit Mean For The UK Construction Industry?